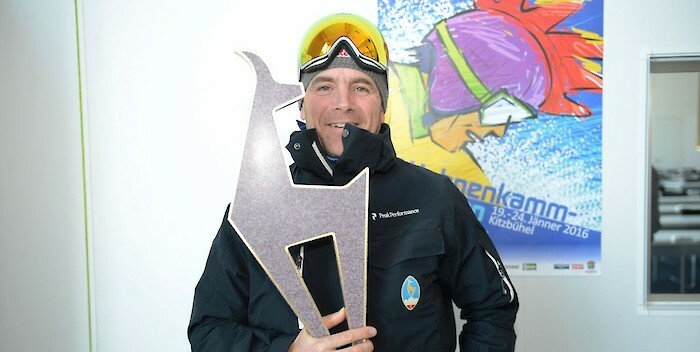 Axel Naglich is a Kitzbühel man through and through. He grew up literally next to the Streif, studied architecture, and, as one of the world’s best known mountaineers, has played an essential role in the Organisational Committee of the Races in Kitzbühel for many years. He is now the Race Director for all disciplines on the Hahnenkamm. Mr. Naglich, as well as your role of Race Director, you are also responsible for the Downhill forerunners. How did today’s casting go? This year we have seven forerunners and I must say, they ski very, very well and are certainly up to the challenge. So, that’s all going really well. The snow was so nice at the Jochberg casting, I think everyone wanted to have a go at skiing in the deep snow (laughs). In other words, the conditions are ideal. What about the Hahnenkamm? Yes, it’s stunningly beautiful up there – and ridiculously cold. The team injected the Hausberg slope with water yesterday, today the Seidlalm jump is on the agenda. I don’t think the conditions could be any better at the moment. Has the fresh snow over the last few days been more of a problem or does it aid preparation work? The situation is a little strange, yes. We’ve had to clear quite a lot of snow from the upper section, whereby we were happy with the level of snowfall on the Hausberg – the bottom part is ideal right now. It seems to be the same every year: No snow at first, then heaps of it. However, if conditions remain the same for the first training session, we really won’t have anything to complain about. How will the Downhill course still change throughout the week? The coaches will give us some feedback, as usual, and we might go over some details and make a few changes. The piste will become a little more compact as people ski down on inspections throughout the week. This is your first time as a Race Director – how have your responsibilities changed? As Race Director, you get more media attention. Personally, I’m not too fond of that (laughs). Today, for example, I’ll be busy until late in the evening, there’s not much room to breathe. Is there a time of year when the Hahnenkamm Races aren’t a focal theme? Not really, no – it’s an all year thing. I’m on the board for the Ski Club here in Kitzbühel and issues keep coming up that need to be sorted out. As Race Director, do you still spend much time on the slope? Theoretically, I don’t really need to lift a finger (laughs). Let me put it this way: they don’t actually need me out on the piste. What I try to do is have a good overview of things, such as the weather forecast for the next few days, finding out whether we can tweak our planning or maybe do some work ahead of schedule. So, it’s more important for me to know what our Plan B is should something go wrong, rather than every detail about the Seidlalm jump. We are extremely organised, though, so usually things go according to plan (smiles). One last question concerning the forerunners: You used to be a forerunner, don’t you feel the urge to give it a go again? That’s what I was thinking as I skied the Jochberg run: it certainly appeals to me! Of course I’d enjoy it. However, I doubt it would be the best idea. I can assure my family that it definitely won’t happen (laughs).